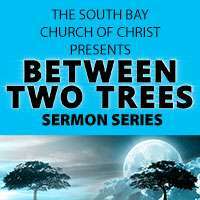 God has a STORY of how he has been working in the world that begins with the tree of life in the garden of Eden and ends with the tree of life in the book of Revelation. We are people who are living in this time “BETWEEN THE TREES,” and we have a role to play in this story of bringing hope, justice, and redemption to a fallen world. While we are still between the two trees of Eden and Heaven, humanity is still waiting. Revelation describes the end of our spiritual road. It is where God's plan is ultimately fulfilled. Christ is the reason why we focus on God's plan and do all that we can to advance his kingdom while we are here. One of the most pivotal points in history is the list of Christ. He linked the old and new testaments together and fulfilled most of the prophecies. He is the gateway to the last Tree in God's plan. Only through Him can we have any hope of making it to the end of God's journey for us. (We apologize for the audio quality). Life doesn't often go the way we planned. Things can frustrate us and cause us to do things that we would normally not like. The Israelites were sent into exile for many years. We can often feel "out of sorts", however God always has a plan. Sometimes the circumstances we are in are according to his plan so that we can grow and even humble ourselves. Do we have the faith to believe in His plan and follow him through all the "chaos"? The Isrealites started out in Egypt as high in the social structure. Hundreds of years later, the Pharaoh feared them and thus, enslaved them. God used specific situations to not only free them from slavery, but also tried to humble Pharaoh, whose heart was too hard to listen. Through Jesus, God gave us the same freedom to live as God wangted us to. While the first tree, Eden, was largely a lesson of how sin takes us away from God, the second step is Abraham and how God used his incredible faith and righteousness to create a whole nation of people. Eden relates to a loss of our relationship with God, Abraham represents God bring his people back to him. The Bible begins and ends in a Garden, Genesis with the Garden of Eden and Revelations, describing a Garden City. We are currently in the time between these two great "trees". Eden started it all and was the birth place of humanity. God intended it for Him to live with us forever, however Satan was able to temp Eve and Adam, dooming humanity to be apart from God, until we are reunited with him again in the Garden City.